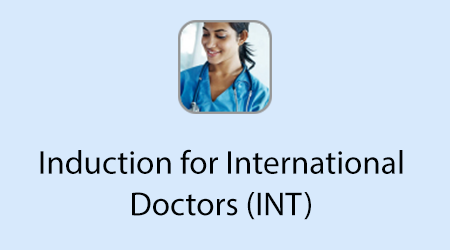 The Induction for International Doctors programme is a web-based educational resource developed by Central Manchester University Hospitals NHS Foundation Trust (CMFT) in partnership with Health Education England e-Learning for Healthcare, to introduce internationally qualified doctors, who are new to UK clinical practice, to ethical, social, legal and professional aspects of UK clinical practice. The programme has a number of interactive e-learning sessions produced by CMFT, along with a number of sessions taken from other e-LfH programmes which supplement the focus of the programme. Sessions include case-based scenarios and are intentionally generic in content, thereby making them useful for doctors of any specialty and grade. It is expected that this e-learning programme will act as a driver for new international doctors to commence a focussed discussion with their educational supervisors, to develop professional development plans and to undertake additional training as per their specialty/local needs. The CMFT International Induction programme won the ‘Lean Health Care Academy Awards 2014‘ for Improving Services through Training & Development and ‘The Learning Award 2015‘ as an Internal Learning Solution of the Year. The video below describes the experience of an international doctor. The NHS has always attracted internationally qualified doctors because of historical links with commonwealth countries and its reputation for developing a high-quality medical workforce. International doctors form a significant part of the NHS medical workforce and constitute 35% (about 83,494) of the total doctors working in the UK. To cultivate further international health links for the UK, the Medical Training Initiative (MTI) Scheme was established by the Department of Health in 2009 to allow non-European trainee doctors to come to the UK and benefit from training and development in NHS services before returning to their home countries. Currently about 5,000 to 6,000 new international doctors join UK clinical practice every year and annually they form about 40% of new doctors starting clinical practice in the UK. A report by the GMC, ‘The state of Medical Education and Practice in the UK’ reported that most non-UK qualified doctors were unfamiliar with the ethical and legal framework of the UK clinical practice when they started working in the UK. The GMC has suggested that NHS Trusts should strengthen induction and support systems for their new international doctors to enhance patient care. If you already have an account with e-LfH, then you can enrol on to the Induction for International Doctors programme by logging in to the e-LfH Hub, selecting My Account > Enrolment and selecting the programme. You can then access the programme immediately in the My e-Learning section.